Posted on November 10, 2017 by N.P. “Poetry Reading, 6 p.m.,” read the sign taped outside the doorway of the Bethune Street townhouse where Otis Kidwell Burger, 93, has lived for nearly 60 years. Inside, from a rocker cushioned with red velvet, Ms. Kidwell Burger presided over the dozen or so poets gathered in her parlor, a cozy haven with Oriental rugs, a working fireplace and shelves of old books and general clutter. 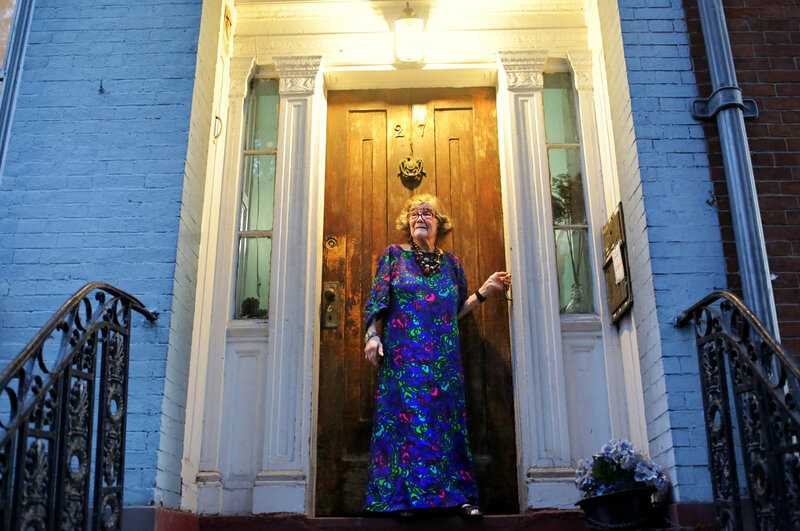 Ms. Kidwell Burger, a writer and sculptor, lives with her two cats in the 1836 building that she and her then-husband, the late literary agent Knox Burger, bought in 1959. Its upper floors served as a rooming house, with rooms starting at $8 per week, she said. “It was full of strange folks,” she said. 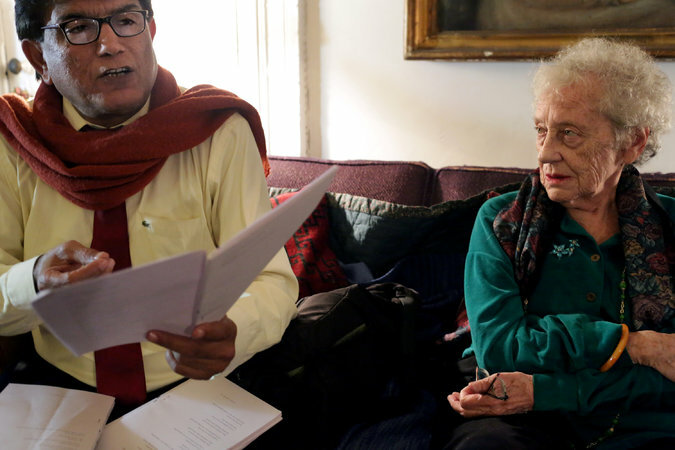 The room next to the magician was rented as a writing space by the author and activist Jane Jacobs, who worked on her seminal book “The Death and Life of Great American Cities” there, Ms. Kidwell Burger said. She recalled being with Ms. Jacobs at a 1968 public hearing for Robert Moses’s plan to build a downtown expressway. “It hit the papers and brought attention to this stupid plan and people thought better of it,” she said. Ms. Kidwell Burger long ago cleared out the rooming house operation upstairs but continued to rent out two upper floors. During the ’80s, the actress Jennifer Grey was a tenant, so Matthew Broderick was often around, and other young celebrities. “I remember Madonna sitting on my stoop,” said Ms. Kidwell Burger, who lived as a child at the top of Todt Hill in Staten Island. She was a zoology major at Cornell University and settled afterward in Greenwich Village. 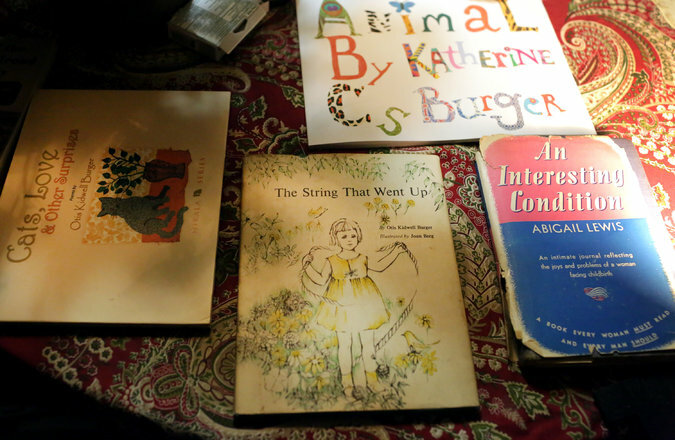 She and her husband hobnobbed with writers like Norman Mailer and Kurt Vonnegut, a family friend who set part of his novel, “Mother Night,” at the Bethune Street townhouse. Ms. Kidwell Burger raised two daughters, made and sold her sculptures, and wrote several books, as well as poetry, science fiction and book reviews for numerous magazines. Her latest book came out this year “Cats, Love & Other Surprises,” illustrated by her daughter Katherine Wilcox Burger. She has a docket of public readings lined up. Ms. Kidwell Burger, who turns 94 on Nov. 9, writes on a Smith Corona Sterling typewriter at a foldout desk. Her assistant then reads the work and types it into a computer. Her Sunday evening invitation-only salons have a Bohemian feel. Many of the poets date back to the Village in the ’50s, and Ms. Kidwell Burger can reminisce about longshoremen working the piers and seaman living in local rooming houses and frequenting salty bars. She can recall freight trains clattering by on the tracks that are now part of the High Line. On a recent Sunday night, part of the reading was devoted to a cache of 45 sonnets that Ms. Kidwell Burger wrote some 50 years ago and then left in a drawer until dusting them off recently. “They’re going to start comparing you to Edna St. Vincent Millay,” said Michael Graves, a poet and salon guest that night. Mr. Graves then read a poem of his about an undocumented immigrant living in New York. Erik La Prade read his poem about the poet W.H. Auden, who lived on St. Marks Place in the East Village. Shelley Seccombe read her poem “Interlude,” which ruminated on the challenges and rewards of negotiating New York’s alternate-side parking regulations. Yuyutsu Sharma, a Nepalese poet who treks in the Himalayas, read his poem about earning the right to be called a New Yorker. Of course, as the old Village’s radical and political roots give way to the forces of soaring real estate, Ms. Kidwell Burger’s townhouse, which she bought for $30,000, is now appraised at $12 million, she said. Telling Detail She used to rent rooms on the upper floors of her Bethune Street townhouse to “artists, sailors, a transvestite prostitute, a magician,” starting at $8 a night. Madonna once sat on her stoop.